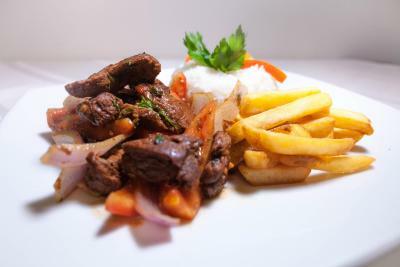 Lock in a great price for Del Prado Hotel – rated 8.7 by recent guests! Very clean. Lovely staff. Great breakfast! Wish there was a courtyard with benches or outdoor space to enjoy. Other than that, it was a wonderful value! The traffic in the city is very bad most of the time, location is important to avoid losing time. 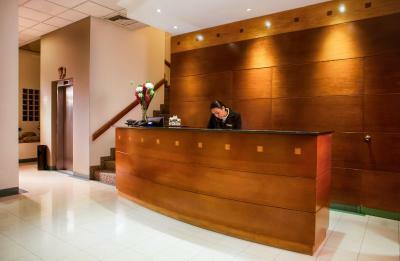 The staff working at the hotel are very friendly and always available to help you to have a pleasant stay. Very accommodating staff. 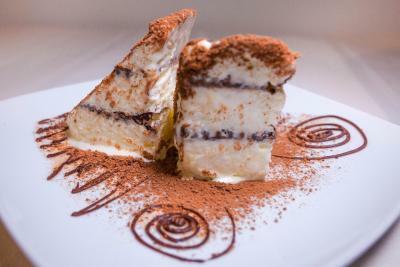 Great location in San Isidro one of the best areas of Lima. Good location to cruz del sul bus station if you plan to take bus to other cities like paracas , staffs are nice and helpful. The staff is helpful.the bed is comfortable.the room is clean. The breakfast is extraordinary nice. Very confortable bed and sheets. 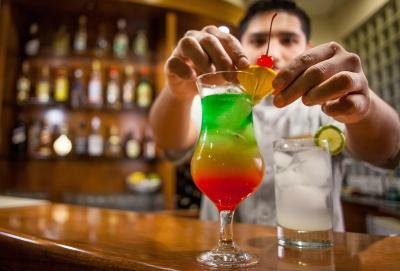 Nice welcome drink. Room well equiped. Very good breakfast. 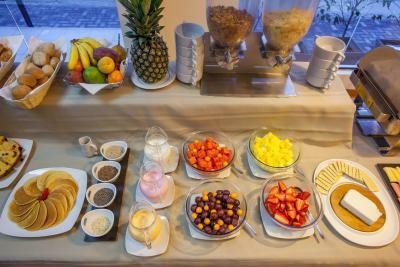 Very good variety and quality of breakfast. Staff is highly focused on making stay as comfortable as possible. It is value for money, clean and tidy. A number of taxi passes the property. We took taxi most of the time and not aware of public transport nearby. Free water bottle. Receptionist is friendly and helpful. Location is safe in residential area. No hot water on night of arrival after 51 hours flying time !needed a HOT shower. Same cold on saturday so brought to their off hand attenrion.For a brief pediod..30minutes..hot water..than back to luke warm tepid cold.Ugh!it's in the business district and 15 - 20 mins taxi to 'anywhere'.never again.hot water counts. 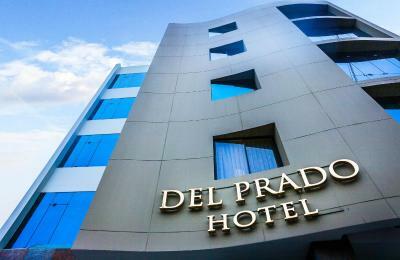 Del Prado Hotel This rating is a reflection of how the property compares to the industry standard when it comes to price, facilities and services available. It's based on a self-evaluation by the property. Use this rating to help choose your stay! 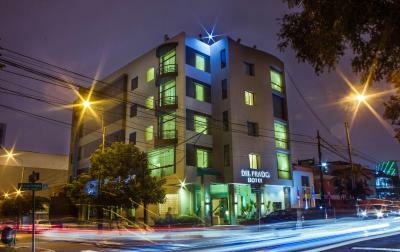 One of our top picks in Lima.Located in the San Isidro neighborhood in Lima, and only a 15-minute drive from Lima’s historical circuit, the hotel offers rooms with park views and a spa bath. WiFi is free. Del Prado Hotel offers fully carpeted rooms with elegant door to ceiling curtains, cable TV, and mini-bars. Some feature hot tubs and views of the park. All include private bathrooms. 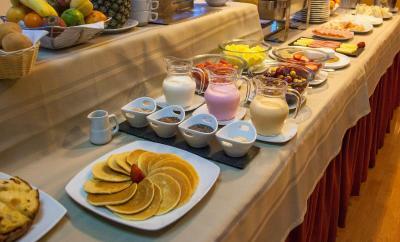 Guests can expect a full buffet breakfast with regional jams, fruits, cheese, yogurt and pastries. 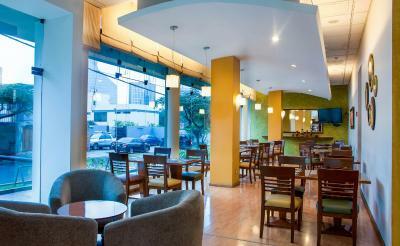 The restaurant and breakfast area receives plenty of light and offers street views. There is free parking on site upon reservation. Guests can find the Cruz del Sur bus station, as well as Oltursa, Ormeño, Excluciva, Tepsa and Movil Tours, only 2 blocks away from Del Prado Hotel. 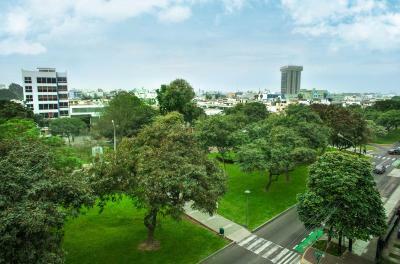 La Rambla Javier Prado shopping mall, Lima Conventions Center, and the Museum of the Nation, are a 15-minute drive away. Jorge Chavez Airport is 12 mi from the property. When would you like to stay at Del Prado Hotel? The suite has balconies and may offer park views. The suite features a hot tub and a small sitting area. House Rules Del Prado Hotel takes special requests – add in the next step! Del Prado Hotel accepts these cards and reserves the right to temporarily hold an amount prior to arrival. The water temperature is hard to control. Mentioned above. To be in Lima and have no outdoor space to enjoy seemed...odd. There's a park right across the street, but no benches on which to sit. Breakfast, it could be better.